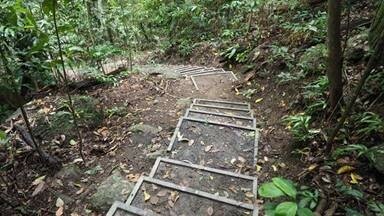 In Goldsborough Valley along the Wajil walk, Queensland Government’s Department of National Parks has used recycled plastic profiles to form staircases on the track’s steeper parts. 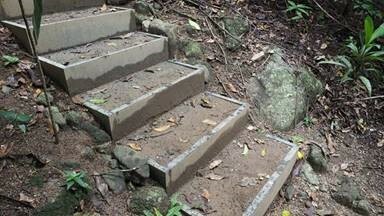 The grey 200 mm x 40 mm Replas planks provide a highly effective solution at the site in Wooroonooran National Park. Using products made of recycled plastic, Parks staff can pretty much simply install and forget. The highly-durable profiles will not rot like timber and there’s no danger of nasty chemicals leeching onto the tropical rainforest floor. When the step cavities are filled with crushed rock, the recycled plastic boards lock in place to provide secure footing for the many visitors who take the walk. 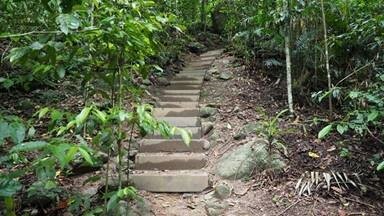 Wajil walk is 48 km south of Cairns, a moderate walk that takes you from the carpark through the rainforest to a lookout over Kearney Falls. Return time one hour.